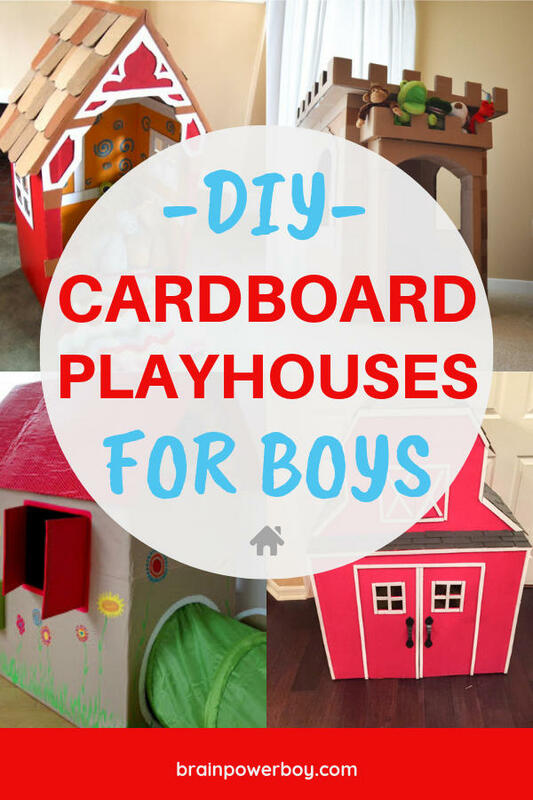 We found some wonderful cardboard playhouses for boys that you (and they!) are going to absolutely love. DIY one of these for him and your boy won’t be able to wait to get inside! 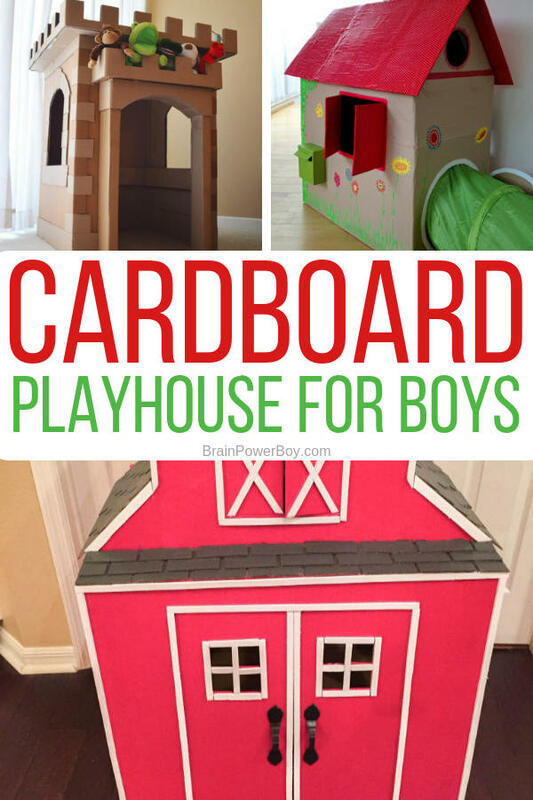 There is nothing like a place of your own, and cardboard playhouses let your boys have their very own mini house. 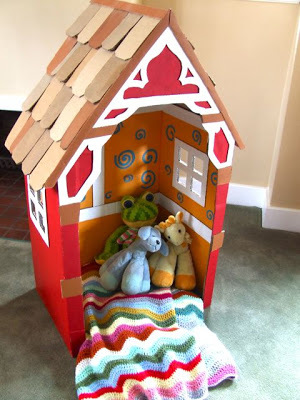 They will really love being able to spend time in their house and they will enjoy bringing in stuffed animals, toys and books to keep them company. These houses are all very boy friendly. I dug around and found some that I think they will really like. All of them are totally DIY worthy. Some are easier than others but all are do-able. You just have to decide how much time you want to spend making one. You have to scroll all the way to the bottom. Though that one is the hardest, it is pretty darn cool and worth a look. 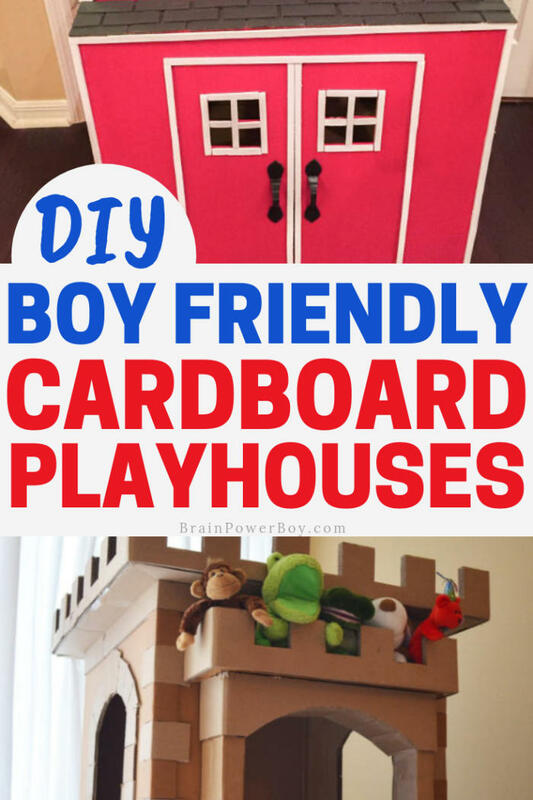 Grab some big cardboard pieces or boxes and get ready to make a cardboard playhouse especially for your boy. Home Depot and Lowes or other home improvement stores can be good sources of large cardboard boxes because they get in large appliances. If you do not have one of those nearby try any local appliance store. Furniture stores can also be source of large pieces of cardboard. I have not found big boxes at these stores but you might get lucky. However, they do have large pieces of cardboard, which you can tape them together in whatever shape you like. Home goods stores, such as department stores, or something like TJMaxx, get in large boxes and may save them for you if you tell them what you are doing. When we were moving, I did run into stores that compact their boxes and do not give them out to people even if you ask. It is a store rule that they compact them all. However, I found plenty of places that would share their boxes, so with a bit of persistence, I am sure you can find the boxes you need to build a super cool house. I thought I would start with this gem. When I found this red barn, I knew I had to include it. Super cute, right?! I love it. She did a fabulous job on the details. Oh boy! There is a lot to love here. 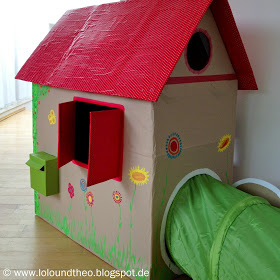 To make this playhouse, you will have to take a look at the images and possibly pop the directions into Google Translate unless you can read German. My favorite part is, by far, the crawl-through tunnel that is attached to the circle door in the side of the house. What a fab idea!! I also like the style of the house and the decorations on it. She chose flowers on part of it, but you could do whatever design you like if you want something a bit more boy. If you think he would enjoy a tower, this is the one you need to make. If you do not have a whole lot of room and want something a bit more open, this is the perfect place to read or cuddle. While small in size, it is big on design. 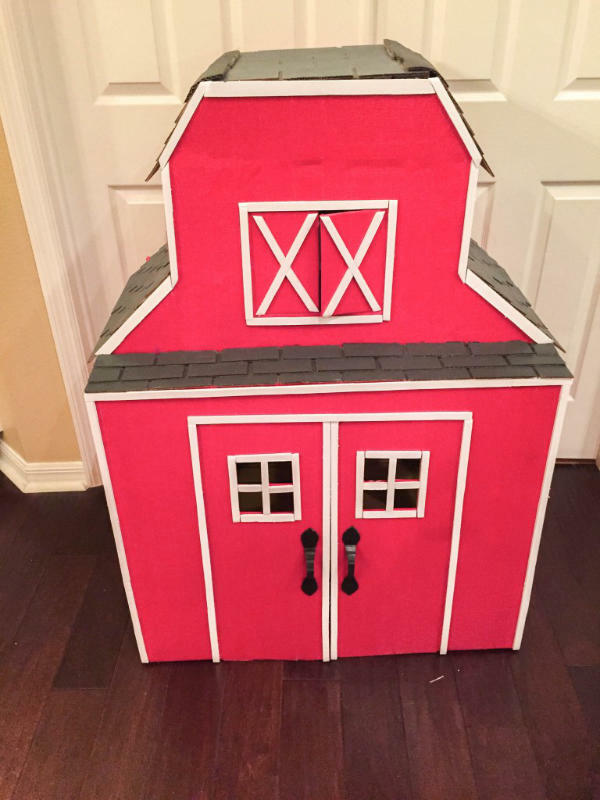 The shingled roof and the gingerbread trim make this a classic charmer. Ok, one more word – WOW! 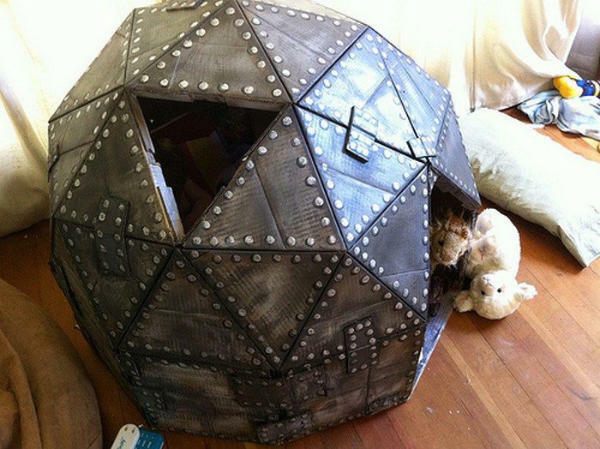 I would have loved to make something like this for my son when he was little, if I knew such a thing existed. The dome shape is amazing, and oh my gosh, the whole look of this is pretty darn slick. I found the log cabin to be very unusual. I can totally see this as a perfect fit for a boy who loves the outdoors. You could even make them a little campfire to put outside it. You can make this in any size. 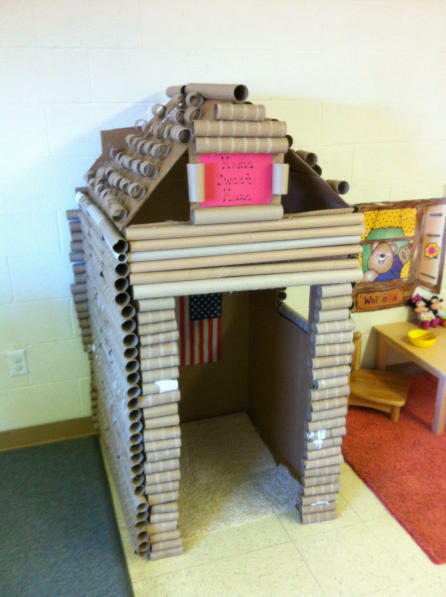 If you want something bigger, simply use a bigger box and more toilet paper and roll towel tubes. What fun! 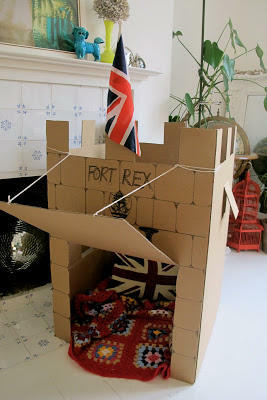 The fort is a great idea! I’m so glad someone made one so I could share it with you today. 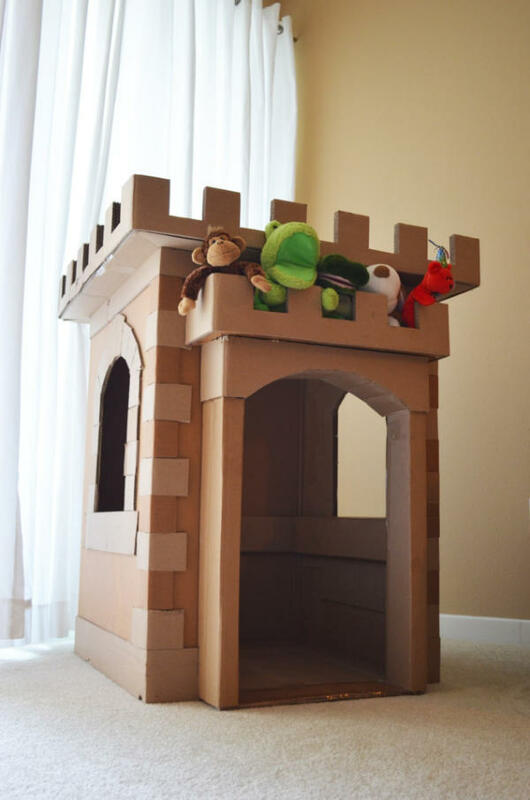 The fort is actually made out of cardboard pieces and not out of a box but you can also use a box if you want to and just make the proper cuts along the top. 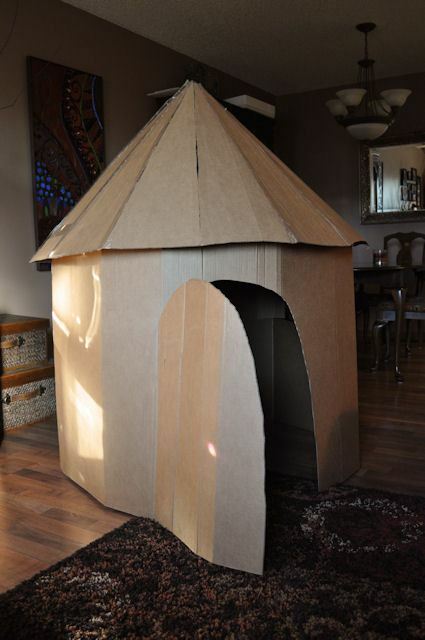 For knights in training or those who love castles and dragons, this cardboard castle playhouse is a win. The details on the castle are very nicely done. This is most definitely for an experienced cardboard wizard.